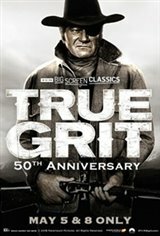 Fathom Events, TCM and Paramount Pictures present True Grit, returning to cinemas for a special 50th anniversary event featuring exclusive insight from Turner Classic Movies! Celebrate the 50th Anniversary of the classic Western that won John Wayne his first and only Oscar. The legendary movie star gives his most iconic performance as Rooster Cogburn, fearless one-eyed U.S. Marshall hired by a headstrong young girl (Kim Darby) to find the man who murdered her father. Laughter and tears punctuate the wild action in this extraordinary film also featuring performances by Robert Duvall and Strother Martin. A true western classic for fans and first-timers, True Grit is a must-see on the big screen.